Sightseeing in Yellowstone is fun, but it can wear you out. You should plan for some downtime while you are in the park. 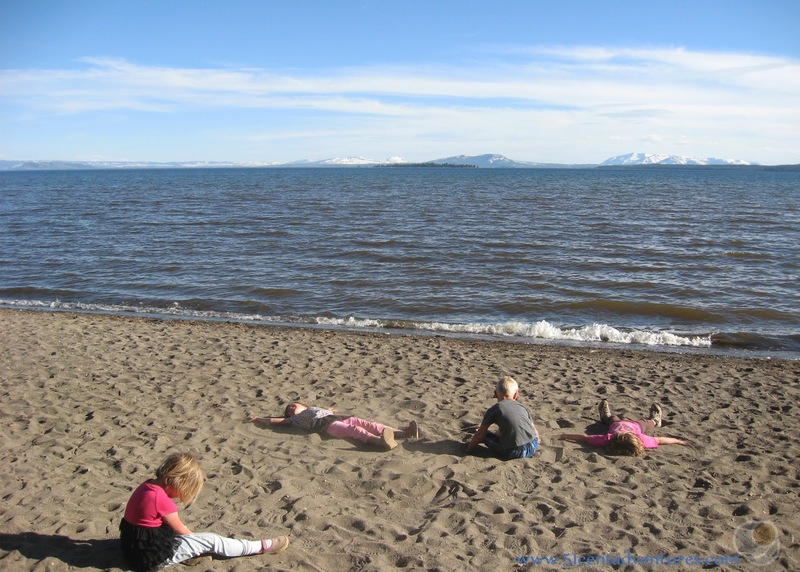 One of the best places to relax is the beach located behind the Fishing Bridge Visitor Center on the north shore of Yellowstone Lake. This sandy beach is especially fun for children who enjoy the chance to run around after a day spent in the car. Location: Fishing Bridge is located on the east side of the park where the Grand Loop Road meets the East Entrance Road. 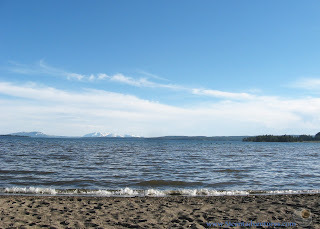 The beach is on the north shore of Yellowstone Lake. Hiking Distance and Time: Maybe a total of 500 feet from the parking lot to the beach. Plan to spend about an hour here. Date of Visit: Saturday June 3, 2017 and other times throughout the summer. In the summer of 2017 I received a job with Xanterra Parks and Resorts in Yellowstone National Park. I moved there with my husband and our four young children. We lived in a 25 foot RV and spent all our free time exploring the park. 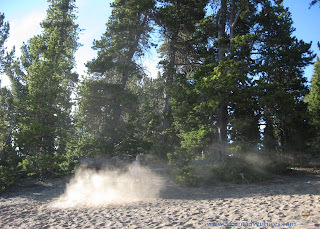 This is the fourth of many posts that I will write about specific features within Yellowstone National Park. At first these aren't going to be in any particular order, but in a few months I'll start grouping them into lists. This one would probably fit into a list such as best places to relax inside Yellowstone National Park. My past three posts have been about some pretty intense hikes within the park. Today I want to talk about a place that anyone can visit. This place is a nice relaxing beach. My favorite place in Yellowstone for kids is FISHING BRIDGE. There's a small visitor center with a few interactive displays, but the best kept secret is if you walk to the back of the visitor center there's a beautiful sandy beach with water. (Lake Yellowstone) Bring lawn chairs or a picnic blanket, then just sit and relax while the kids play ALL AFTERNOON, building sand castles and wading in the water. It's such relaxing fun on a sunny afternoon, and the kids just love it! 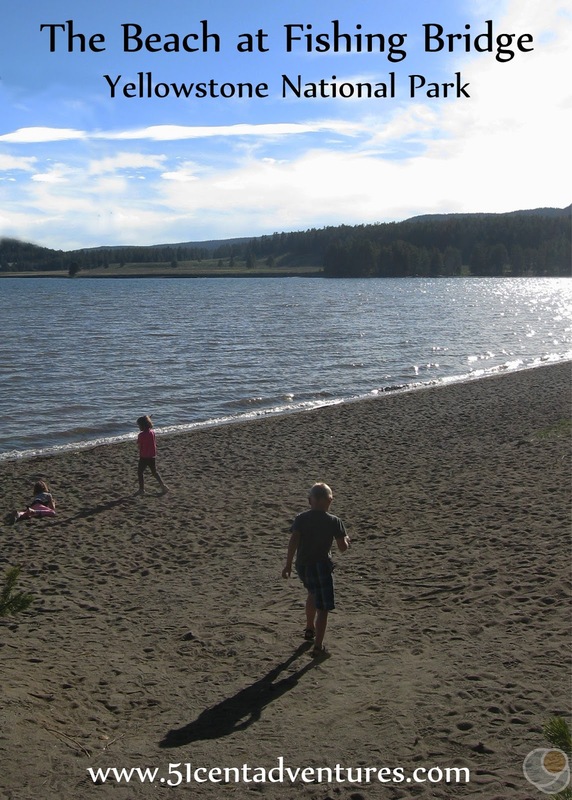 Once we discovered it, we always had to make sure to include a day for family beach time during every subsequent trip to Yellowstone. She made the beach sound so great that we went to check it out a day or two later. 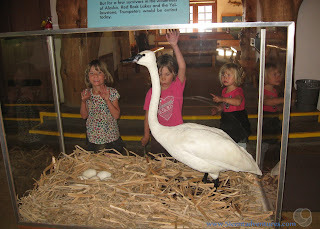 Honestly, before our summer in Yellowstone I didn't even know that the Fishing Bridge area had a visitor center. I knew it had a bridge, obviously. 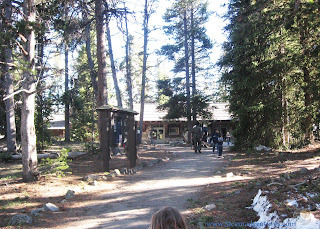 And I think my husband and I walked around the little general store when we visited the park in 2009, but I'd never noticed the visitor center that's located a little east of the actual Fishing Bridge. That's because the visitor center is set far back from the road and is constructed to blend in with the natural features. Inside the visitor center there is a great collection of taxidermied birds that have been in this visitor center since 1931. These displays are a great way to learn about the animals inside the park. My aunt was right about about the beach behind the visitor center. 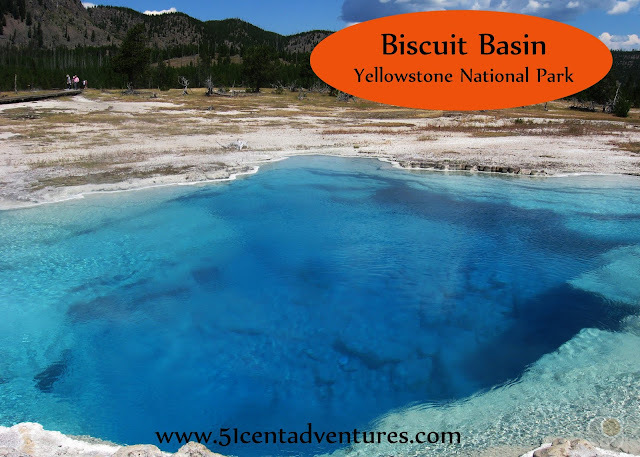 It really is one of the best kept secrets in Yellowstone. 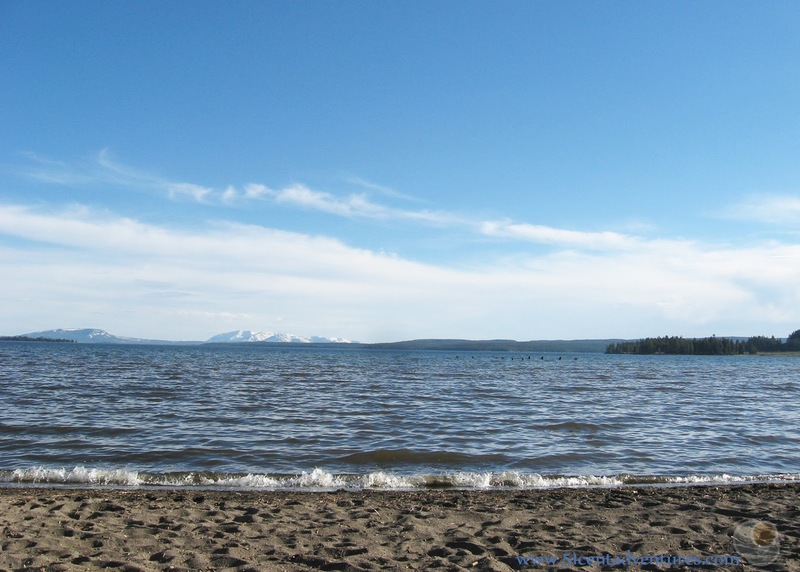 Some of the best views of Yellowstone Lake can be found on the back porch of the Fishing Bridge Visitor Center. 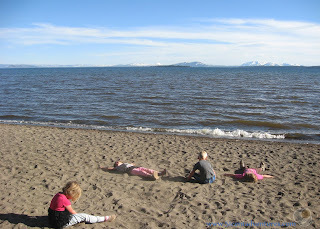 And just like my aunt predicted, my kids loved playing on the beach. We'd planned to only stay for a few minutes, but instead we were there for over an hour. They dug in the sand and built sand castles. My son had a lot of fun stirring up a large cloud of dirt. Before we left two ladies called over to us and said, "You two are great parents." I guess they liked how we just let our kids enjoy nature. One of my sisters came to visit a few weeks later. She told me, "I'm here to see you, not the park. So we don't have to do a bunch of sight seeing." I figured a trip to the Fishing Bridge Beach would be perfect. 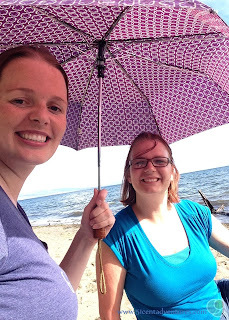 We had a lot of fun sitting in the shade of an umbrella while the kids played in the sand and the water. 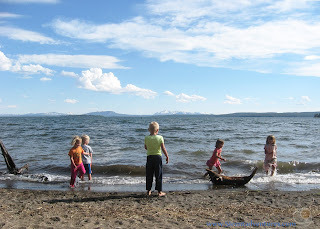 The water was a little warmer on this visit and so the kids were more willing to get into it. Most of them were soaking wet by the time we left. I was glad that we always keep changes of clothes in the car. 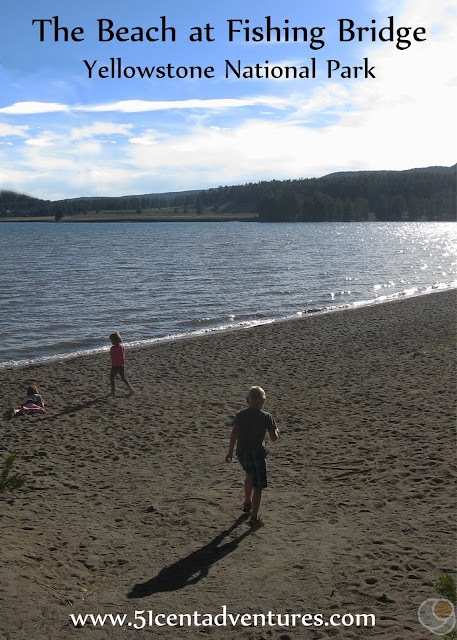 We came back to the Fishing Bridge beach a few more times during our summer in Yellowstone. 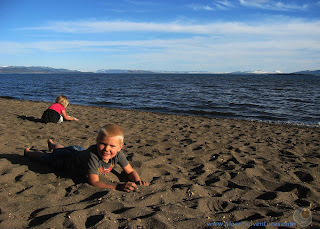 Our kids always enjoyed the chance to play in the sand. Recommendation: The beach at the Fishing Bridge Visitor Center is the perfect place to retreat when you need a break from sight-seeing. It's an especially great place to visit when the park roads are full of tourists. I suggest planning a stop here in the mid afternoon. You can relax on the beach while everyone else is fighting traffic. Directions: The Fishing Bridge Visitor Center is located a mile east of the junction where the East Entrance Road meets the Grand Loop Road. The visitor center is on the south side of the road. There is a general store and some other amenities located on the north side of the road. The actual Fishing Bridge is located a little to the west of the visitor center. Places Nearby: The actual Fishing Bridge is within walking distance of the Fishing Bridge Visitor Center. This bridge spans the Yellowstone River as it flows out of Yellowstone Lake. Fishing has been prohibited on this bridge for years because it is built over a spanning ground for cut throat trout. Many people enjoy walking over the bridge and admiring the river and lake. However, I think the bridge is overrated. If the area is crowded skip the bridge and head for the beach.